I looked around and found some of the MySQL engines are innodb and MyISAM. Perhaps there are few more. My question is what are these database engines? 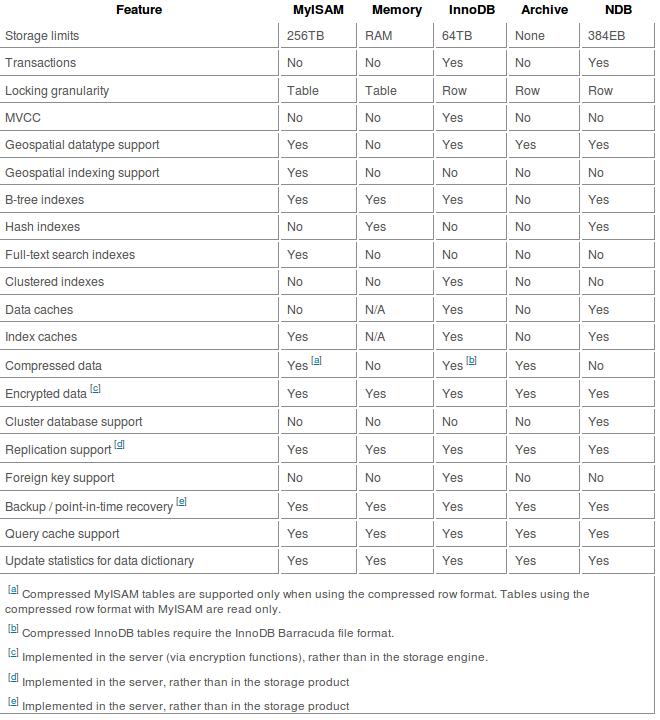 What are the differences between different MySQL engines? And more importantly, How do I decide which one to use? I personally always use InnoDB if I have to use MySQL. It supports transaction and foreign keys while MyISAM doesn't. MyISAM and InnoDB are the most commonly used engines. MyISAM is slightly faster than InnoDB, and implements the FULLTEXT index which is quite useful for integrating search capabilities. MyISAM is not transacted and doesn't implement foreign key constraints, which is a major drawback. But you can use the best of both and create tables with different storage engines. Some software (WordPress, I think) use Inno for most data, like relations between pages, versions etc. Records for the posts contain an ID that links to a record in a separate content table that uses MyISAM. That way, the content is stored in the table that has the best search capabilities, while most other data is stored in tables that enforce data integrity. If I were you, I'd pick Inno, because it is the most reliable. Only use MyISAM for specific purposes if you need to. You can configure your database to use InnoDB by default when creating new tables. Different storage engines available, there are few reasons not to use either the MyISAM or InnoDB engine types. MyISAM will do in most situations, but if you have a high number of updates or inserts compared to your searches and selects then you will get better performance out of the InnoDB engine. To get the best performance out of InnoDB you need to tweak the parameters for your server, otherwise there is no reason not to use it. The MERGE engine is an exceedingly effective way of querying data from multiple, identically defined, tables. The MEMORY engine is the best way to perform a large number of complex queries on data that would be inefficient to search on a disk based engine. The CSV engine is a great way to export data that could be used in other applications. BDB is excellent for data that has a unique key that is frequently accessed. A database engine (or storage engine) is the underlying software component that a database management system (DBMS) uses to create, read, update and delete (CRUD) data from a database. Most database management systems include their own application programming interface (API) that allows the user to interact with their underlying engine without going through the user interface of the DBMS. Not the answer you're looking for? Browse other questions tagged mysql database storage innodb database-engine or ask your own question. Is this transaction code work correct? How can I check MySQL engine type for a specific table?